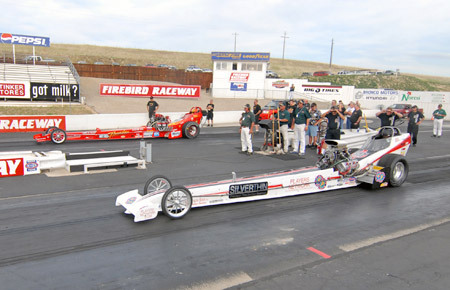 For the 37th time the Ignitor Opener marked the official start of the 2007 racing season at Boise, Idaho's Firebird Raceway. Following three days of time trials and qualifying under very hot conditions, Sunday revealed superb air for all the racers. Temperatures just barely hit 70 degrees on the final day of eliminations, a nice change following the 90 plus degree heat wave on Saturday and a large turnout of racers and fans loved every minute of it. 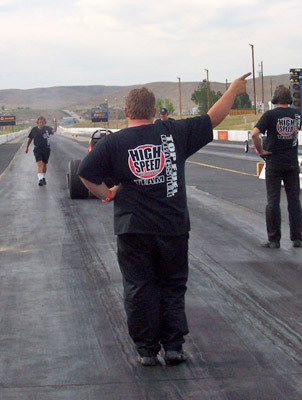 After their success here at the 2006 Nights of Fire event the High Speed Motorsports team had high hope for a win at this race. 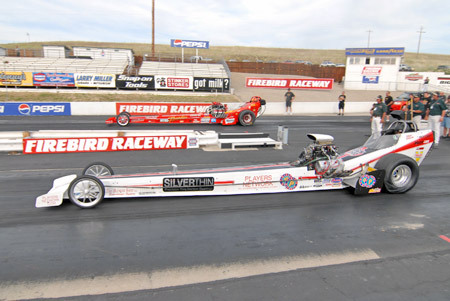 After not getting an ET on their first qualifying attempt due to the car in the other lane hitting the timing blocks they came back for the second and last session to go low with a 5.909. 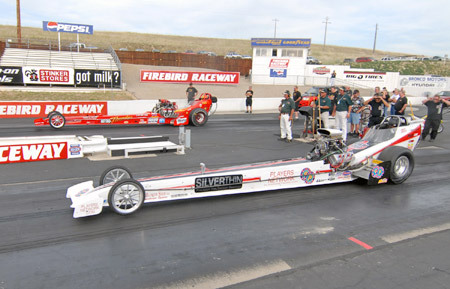 This set the stage for eliminations on Sunday and great expectations for their first Ignitor title. Warming up the engine prior to the first session on Friday. The first round qualifying didn't go as planned. 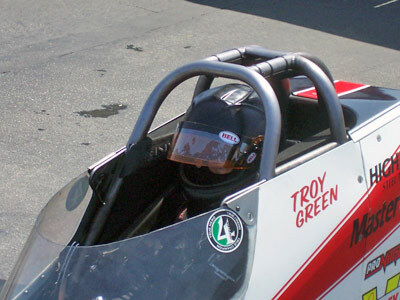 It paired Troy Green in the right lane, Brett Harris in the left. Green's car shook the tires at about 150ft, he pedaled it and got it to recover. Harris crossed the center line at about 1000ft mark taking out the clocks disqualifying not only his time but Green's as well. That was not good news but after getting back to the pits the news got worse. They noticed the Donovan block was cracked which forced them to swap short blocks. 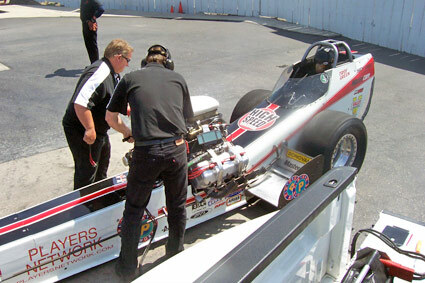 For his second qualifying attempt Green was once again paired with Brett Harris. 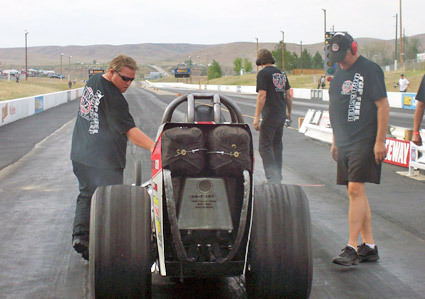 Walt Stevens and Brett Johansen guide Green back from his burnout. The High Speed car left good and pulled hard to about 1200ft and Green shut it off. 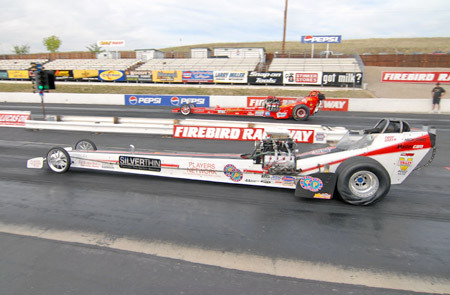 In spite of some burning oil getting back in the car, the run put them in the number one spot with a 5.90 at only 228. Troy Green packs his chutes. 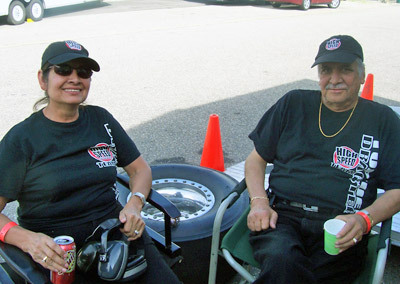 Amelia and Dale Singh (CEO High Speed Motorsports) relax after qualifying on the poll. The crew had a chance to kick back as well. Due to an extreme shortage of photos this is a report that can only be told. 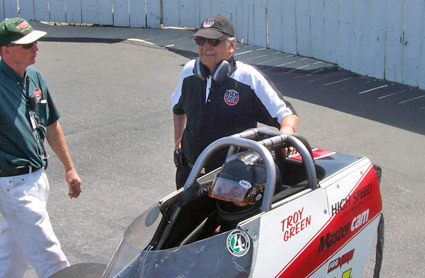 Dale Singh and Troy Green prior to round one of eliminations. Brett Johansen and Tom Shelar fire the car. Green backs up from his burnout. Johansen makes final adjustments prior to Green Staging. 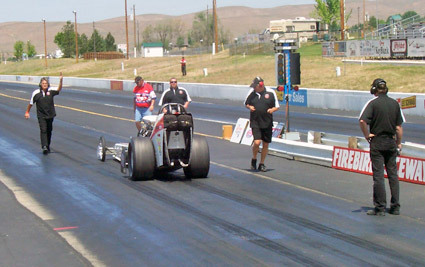 First round eliminations: Troy Green was in the left lane, Shannon Stuart in the right lane. Green had the hold shot with a .079 light to Stewart's .140. 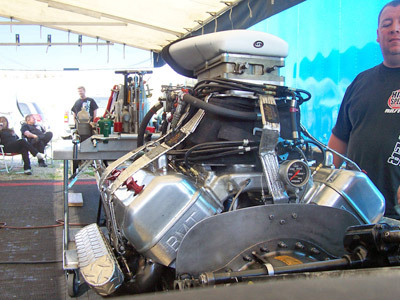 Green's engine was a little unhappy at about 1000ft so he wisely shut off early running a 6.05 to Shannon's 6.06. As the times suggest, it was a very close race. Second round of Eliminations: Green had a bye run because of being number one qualifier and the odd number of cars. 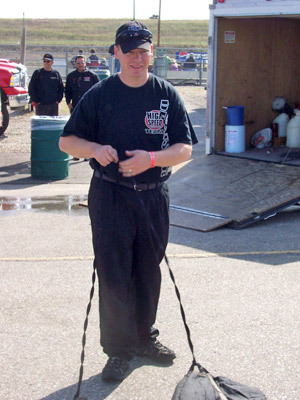 With their spare short block in the car and no other back up, they decided to just idle down the track knowing they would not get lane choice in the final. Final round: Green was in the right lane and Mike McClennan in the left. The last time Green ran in this lane the car shook the tires. They made a tire pressure adjustment trying to get through the potential shake. At the hit McClennan had a .058 light to Green's .063 and they were pretty even until about 150ft when the High Speed car shook the tires into smoke. Green pedaled it and it recovered and tried to chase down Mike who was only about a car length ahead of him. Approaching the finish line Green knew there was no way to catch the Nitro Fever car and because his engine started to push out some oil he lifted. McClennan ran a 5.97 to Green's 6.16. Had it not been for an unusual rash of parts failure this would have been a good weekend for the team and solid prep for the National Hot Rod Reunion in June at Columbus, Ohio. Now the trip east may be in jeopardy due to lack of equipment. Check back for updates.